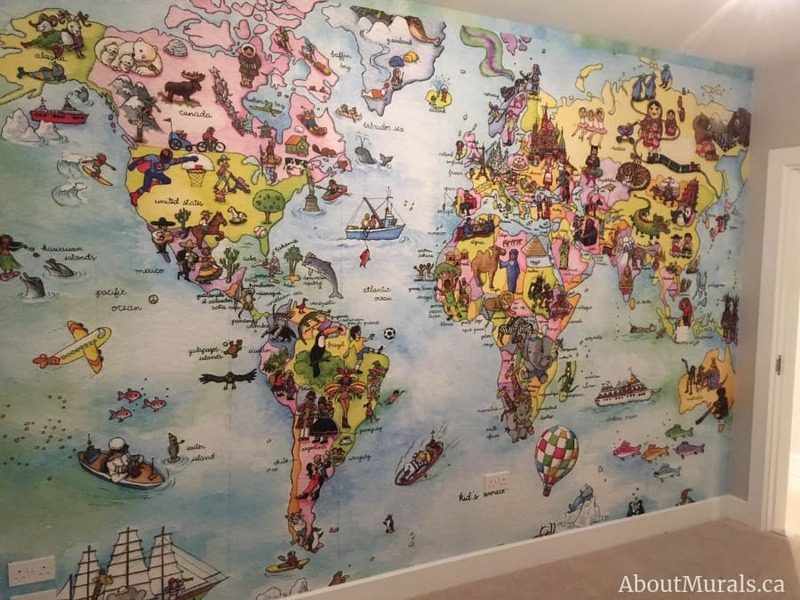 Are you looking for a kids world map wallpaper, but having a hard time deciding on a design you like when looking online? 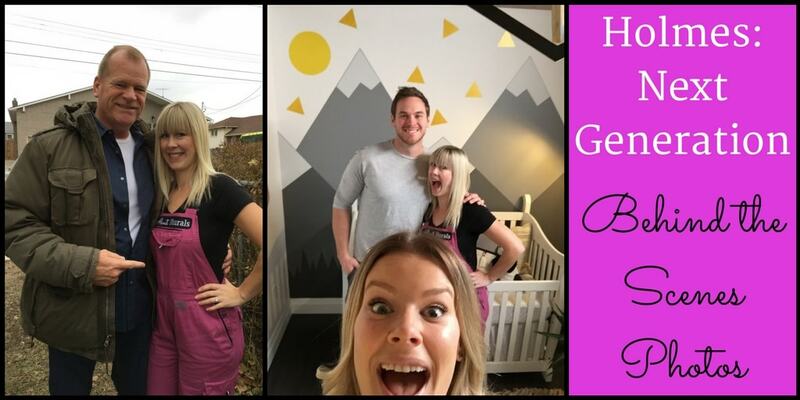 I spend hours every month gathering photos of my murals in real customer’s homes, so you can just scroll down for some inspo and to see if this design is right for your home. 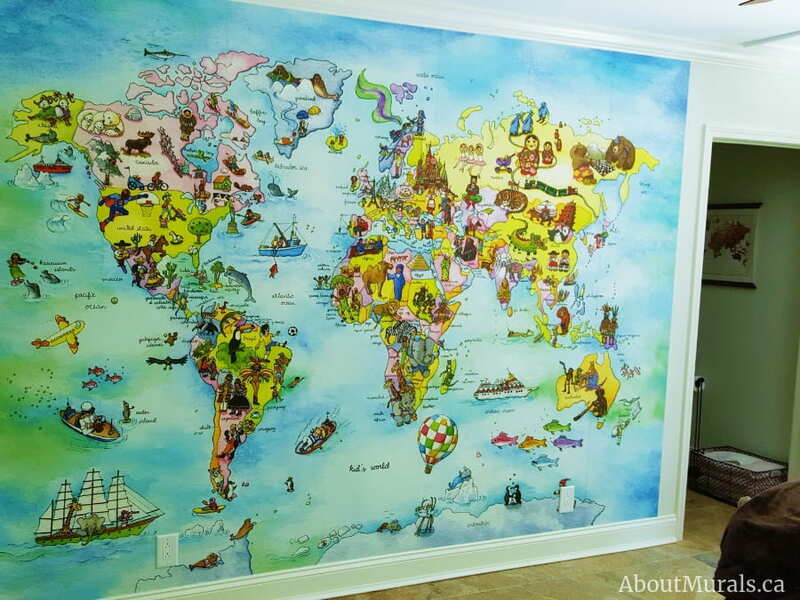 That being said, it’s hard to see all the detail of my wallpaper murals when furniture covers it, so here’s the kids world map wallpaper in all its glory. And a close-up to see all the glorious detail! 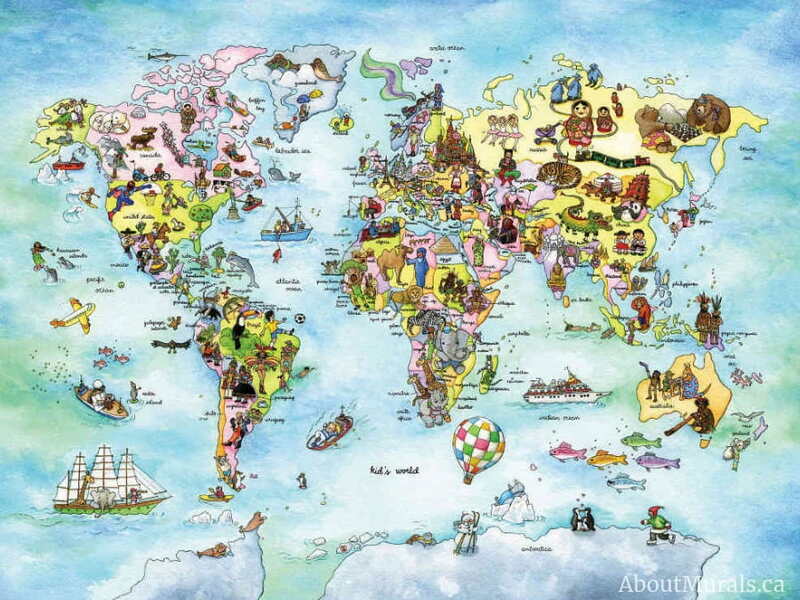 I know it’s difficult to see all the detail in this adorable mural, so here’s a close-up photo of the kids world map wallpaper. 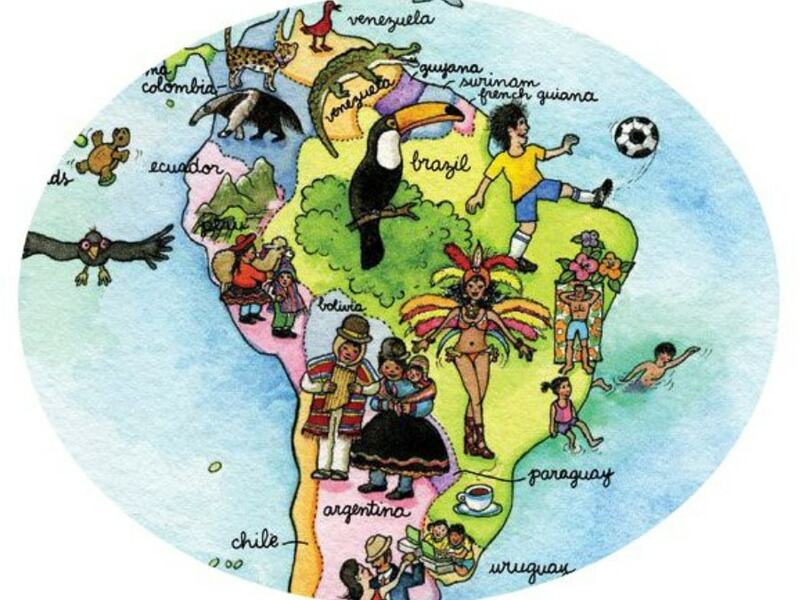 What an amazing way to talk with your kids about different cultures and perspectives. You can even use it to plan all your family vacations, too! This mural is NOT for you if you want a smooth, computer illustrated map mural. BUT if you want a mural that looks like a real painting, with texture and brush strokes, this design might be for you. This mural is a watercolor painting that got scanned by a high resolution scanner, which makes a mural that actually looks like it was painted on the wall. It’s super crisp and clear! The great news is that all my wallpaper murals are removable! I even made a How-To Remove video for all my DIYers out there. Just pull the panels up and off, with no damage to the wall underneath. 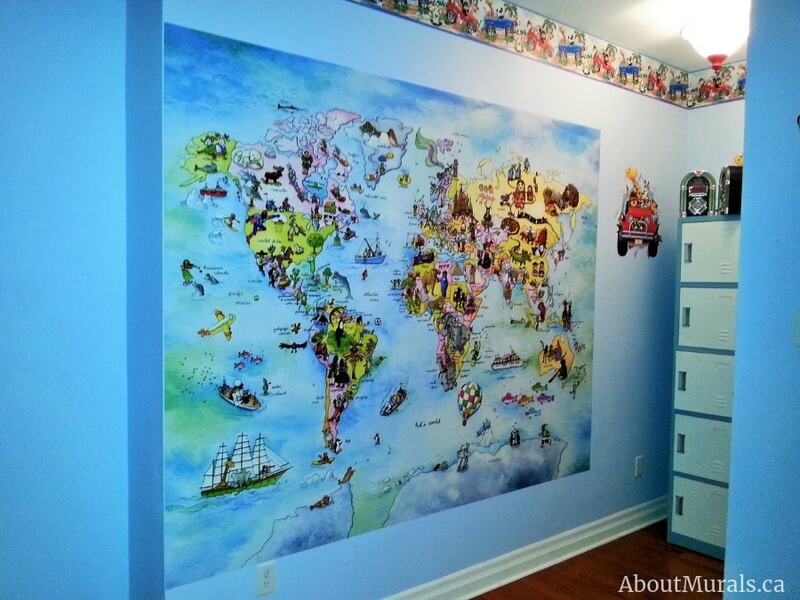 I made you a How-To Hang video to go with the written instructions that comes with this kids world map wallpaper. The wallpaper is pre-pasted so you don’t buy or apply wallpaper paste to the walls or the paper…meaning you don’t “book” the wallpaper. Phew! You don’t double-cut the seams (just Google this scary process. Eek!). My seams simply overlap and become invisible once you use the crayons on the edge. Check out my video to see what I mean. Are safe to hang in any room…even a baby’s nursery…because there are no VOCs or dangerous chemicals in the toner. These wall murals are compliant with the US and EU black-list US-C-070928PROPIC-65, and EU Standard EN71-3 (heavy metals). Yup…that’s heavy duty compliance! Are safe for your kids because these murals are CPSIA compliant which looks at things like lead, phthalates, durable infant or toddler products and makes sure all children’s products comply with all safety rules. 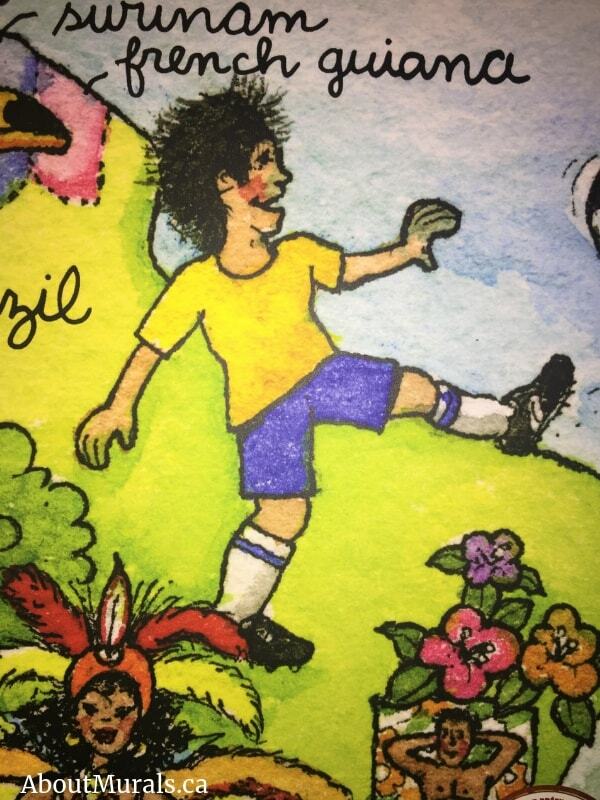 Keep our planet healthy for our kids and grandkids because these murals are fully de-inkable (AKA 100% recyclable). Keep our forests healthy because the wallpaper is printed on FSC certified paper. 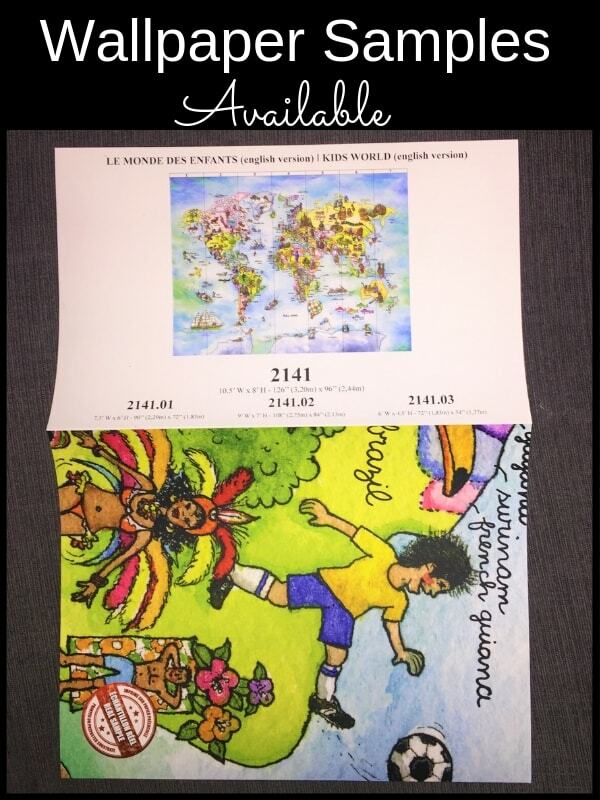 Are reusable so you take your mural with you if you move or gift it to a friend if you get tired of the design. Good for the environment and great for your wallet! Make less of a carbon footprint because they’re printed by toner that’s 100% made with green energy. Still not sure? Buy a wallpaper sample! Are you unsure if the colours will match your décor? Or maybe you need to feel the quality of paper? Want to test out the “removability” of the wallpaper on a hidden wall somewhere? Whatever the reason that you’re still unsure, a wallpaper sample might help ease your mind. But why buy from me?